The Stone school was built in 1863, by Thomas Gotlieb Engelhorn for a cost of $5,000. The two-story building, three blocks west of the Mississippi River, was constructed of locally quaried limestone and of oak and white pine materials. It opened in 1864 and was used continuously by Lansing children for 108 years, closing in 1973. A master's thesis prepared in 1969 by Lawrence Hammel, a former science teacher here, said about the building: The first high school graduation was held in 1882, two years after the first two-year high school course began in 1880. One student graduated that year. The stone building ceased to house high school students in 1916 when a brick building was built that year. At one time the Mississippi River town was expected to boom and additions to the stone building were made in 1867 and 1892 to accommodate more students. However, the population here decreased after 1875. The eight-classroom building is characterized by two-foot thick walls, but perhaps the most striking structural aspect is the building's 12-foot ceilings. The school was built of native limestone in the classic Greek Revival tradition that was popular in the Civil War era. The original building was a 40-by-56-foot structure with a 14-by-30-foot projection for the entrance. Throughout the years, several changes took place in the school. Originally, each room was heated by individual wood stoves. In 1890, a Florida steam heating apparatus was installed to heat the entire building. Other renovations, such as indoor plumbing and electricity were soon added. 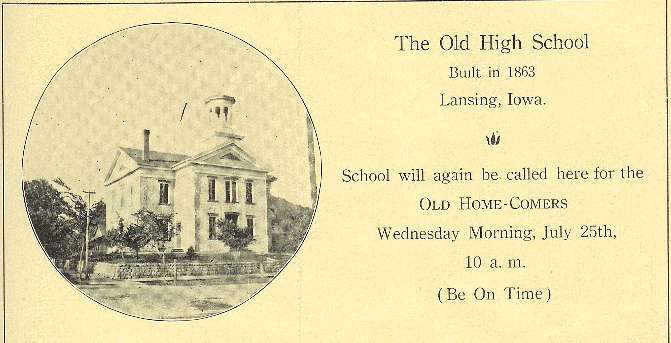 In 1915 Lansing residents voted to build a new high school, however the old stone building was still used as a grade school until 1973. In 1973, the Old Stone School was entered in the National Register of Historic Places. Now, just nine years later, it is in danger of being demolished! It was originally constructed as a school in 1864 and was used continuously for that purpose for 108 years, the longest of any school in Iowa, and in the Midwest, west of the Mississippi River. It was built of native limestone with walls two feet thick and finished with native oak and white pine. In 1867, the south wing was added, and in 1892 another wing was added to the west to accommodate a growing numbers of students at the primary, intermediate and secondary levels. 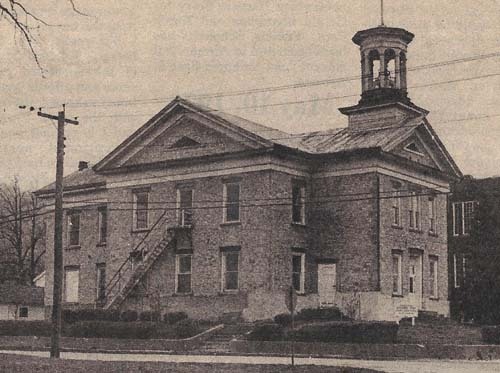 It was not until 1915 that the school board decided a new building was needed to accommodate the high school students; and from that time, until 1968, it was used exclusively as a primary school. Through the years, thousands of students have been educated in this building, and many of them are concerned about the prospect of its being torn down. It is up to us, the citizens of Lansing, to do everything in our power to save this beautiful landmark, which is a part of the heritage of all of us. So often today, historical buildings and reminders of our past are torn down, in the name of progress, to be replaced by a modern building or parking lot. It is up to us to retain these landmarks for future generations to use, enjoy and give them an appreciation of the history of our community and our forefathers. Structurally the building is in good shape, but the roof is in need of repair, and because of this there has been some damage to the floors. When it is restored it would make a beautiful museum and community center  which our town needs  and could be used for years by many people and all of the organizations in town. We must act now!! Once it is torn down, it is gone forever and a part of our history with it. There will be a meeting on Thursday, May 20, at 7:30 p.m. in the library of the Middle School to set in motion plans to save this beautiful landmark. We urge everyone to attend. We need your ideas, interest and support for this very worthwhile project. 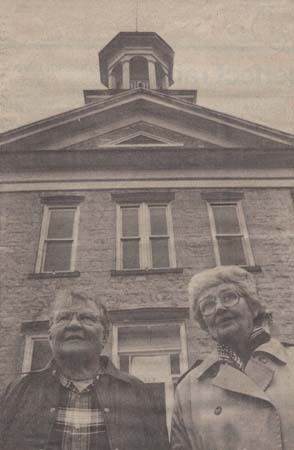 Pat Kerndt, right, president of the Lansing Stone School Corp., and Sara Smerud, longtime historic preservation proponent, stand in front of the Stone School at Lansing. Efforts are under way to preserve the 119-year-old northeast Iowa landmark. Like the limestone bluffs that line the Mississippi River three blocks away, the old Lansing stone school looks solid and steadfast. The two-foot thick limestone walls looked like theyd stand until Gabriels trumpet until last year when the 119-year-old landmark nearly met the wrecking ball. Now it should be around at least 119 more years, thanks to a fundraising drive to preserve and restore the building to public use. In 1973 there came an ending and a beginning for the building. The Eastern Allamakee school district closed the school in May after 108 years; it was the oldest school of an independent district in continuous use in the Midwest west of the Mississippi. The school was also named to the National Register of Historic places through the efforts of Sara Smerud, a now-retired school social worker. The school was used for storage and for a Bicentennial display in 1976. But although Smerud wrote countless letters urging preservation of the building and secured a $1,000 matching grant, the money was never used. Tightening economic times dictated spending money in places other than an old school building. By 1982, the building was identified as a definite liability to the district. Water leaking through the tin roof eroded one wooden stairway. Wooden floors had buckled and cracked. One floor settled at least 6 inches. Paint and plaster flaked off the ceilings and walls. When it appeared that the landmark would be lost, area residents finally expressed concern. A non-profit corporation, the Lansing Stone School Corp., was formed in May 1982. It paid $1,000 in transfer costs to officially buy the building last month. Today, theres a good news, bad news story coming from the group. Its going to take about $28,000 just to repair the neglect. Thats the bad news. The good news is the receipt of a $10,000 grant from the National Park Service administered by the state historical departments office of historic preservation. Another $4,000 grant is still pending. To use the funds, the group has to match them with local money. About $9,000 has been raised and the fund drive is continuing. Pat Kerndt is president of the preservation group. "I just like the school. Its a beautiful old building," she said. l hated to see it torn down because I like old things." She talked her son Gus, an attorney who works at the familys Kerndt Brothers Savings Bank, into writing the grant proposal which details the stone schools needed repairs. Replacement is needed for the roof, soffit, fascia, window frames and sashes, gutters, molding and bell tower along with tuck pointing and bracing floors. The first goal is simply to stop deterioration. But the planning doesnt stop there. "I hope this thing goes to the point where the building will be reused," said Gus Kerndt. Possible uses would be as a city hall, community center, fitness or racquetball center, museum, day care center or other venture which would generate enough money to maintain and improve the building. Work has already begun. Culpitt Roofing of West Salem, Wis., is putting a new tin roof on for $10,350 and repairing the bell tower. for $3,000. Mauss Home Improvement of Lansing will repair soffit and fascia for $2,000. Smerud, the original pusher of the project, is happy to serve on the board of directors with Kerndt, Shirley Darling, John Dunlevy, Ferne Wendel, Mary Lou Ferkingstad, Bev and Charles Fitz, Judy Davis and Gladys Jenkins. "A lot of people have left from here and have fond memories of this place," she said. "Many are willing to donate not only time, but labor when interior work gets under way." Tax-deductible donations are accepted [address removed]. The old school building remains on the National Register of Historic Buildings and is administered by a non-profit corporation.